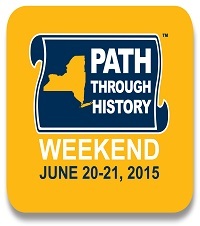 In August, 2012, Governor Andrew Cuomo announced the creation of Path Through History Weekends, showcasing New York State’s history and cultural significance. Follow the Path to Blessed Trinity on the weekend of June 20-21. Our friendly docents will once again be available to lead tours of the exterior and interior of the church building, including descriptions of architectural features and explanations of symbolism and artworks. Visitors are encouraged to bring binoculars and cameras. The event is free and open to the public. Details as they become available.